Some people are drawn to the idea of vegetarianism or veganism in hopes of becoming more healthy, and living longer. Others want to do their part to reduce pollution, or become ethically opposed to eating animals or animal products. Either way you slice it, change is in the air. Whether you are vegetarian or not, vegan or not, or just a curious omnivore that participates in “Meat-Less Mondays” – it’s a fact, the paradigm is shifting to a more compassionate world. 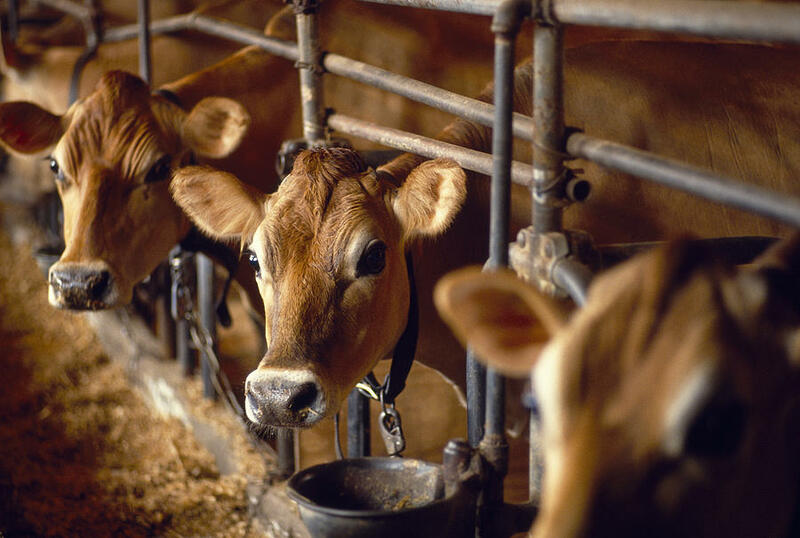 With increasing knowledge of our food sources, exposing of cruel factory farming processes, and the rise of sustainable alternatives, we can now make more educated decisions of what we support. And by support, I mean- what we buy. Fact: As Americans we’re buying/eating less meat. Which means, people who are eating less meat are actually saving lives. And not just the lives of factory farmed animals: it’s estimated 70 percent of all diseases, including one-third of all cancers, are related to diet. A vegetarian diet reduces the risk for chronic degenerative diseases such as obesity, coronary artery disease, high blood pressure, diabetes and certain types of cancer including colon, breast, prostate, stomach, lung and esophageal cancer. Which is probably one of the main reasons an omnivore would want to add more fruits, veggies & meat alternatives to their diet. A whole 36% of Americans are open to plant-based eating diet, although they do not identify themselves as vegan or vegetarian. “In a 2013 Mintel study, it was found that while more than a third of Americans buy meat alternatives like Gardein, less than 10 percent of Americans identify as vegetarians. In other words, the market for vegetarian meats is being largely driven by non-vegetarians,” Shapiro explains. This of course doesn’t make vegans, vegetarians or the plant-based-diet movement any less efficacious. In fact, demonstrating that omnivores can effectively reduced the slaughter of farmed animals is a WIN in my book. Based on these numbers alone, participating in Meat-Less Mondays, or switching your lunch from a beef burger to a Gardein patty DOES & CAN make a difference. YOU can make a difference, simply by making small changes to your diet and lifestyle. A world that eats less meat- is not an Utopian illusion, it’s quantifiable and measurable. It all ads up and it is in the direction we are going. 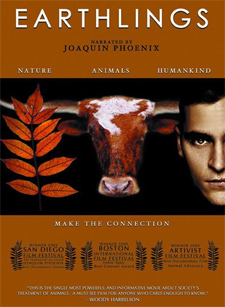 Directed by Shaun Monson and narrated byJoaquin Phoenix, Earthlings is a documentary film by Nation Earth that portrays the pathetic treatment of animals. The 95-minute documentary uses hidden cameras to bring to you shocking footage of what goes on behind the closed walls of the meat industry. 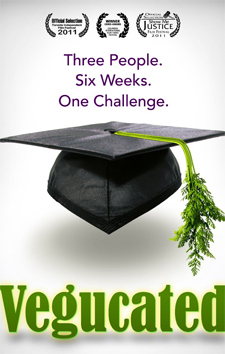 Vegucated is a socio-comical documentary about 3 omnivore New York guys who plan to go vegan for six weeks for weight loss and other health benefits. But during their vegan journey, they uncover the dark side of animal agriculture, and all of a sudden find themselves against the very industry they patronized a few weeks before. This beautiful documentary by Marc Pierschel interviews several vegan proponents and explores the health, environmental and ethical reasons for adopting a vegan lifestyle. 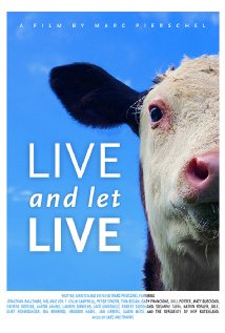 It tells the stories of 6 different individuals who turned vegan for their entire life; it’s touching indeed to see a butcher turn into a vegan chef, and a factory farmer into a farm sanctuary owner! 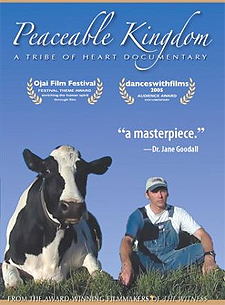 This multi-award winning 70-minute documentary tells the story of several traditional farmers who are forced by their conscience to re-examine their relationship with animals. It’s touching to see how the farmers adopt a vegan lifestyle and create a sanctuary for abandoned, destitute farm animals. There is a newer version of the documentary created by the same producer (James LaVeck) and director (Jenny Stein) in 2009 with a different starcast under the title, Peaceable Kingdom: The Journey Home. 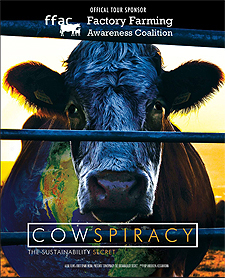 Cowspiracy is a crowdfunded documentary film co-produced and co-directed by Kip Andersen and Keegan Kuhn. It tries to analyze the policies of various environmental organizations like Greenpeace and Rainforest Action Network in the light of environmental impact of animal agriculture. 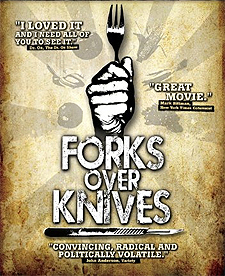 Forks over Knives is a health focused documentary that establishes a strong correlation between degenerative diseases and meat-based diet with some solid, statistical proof. The film features a team of doctors and researchers to highlight common pains and sufferings like obesity and diabetes that have become the fate of most Americans today, and asserts how it can be alleviated by adopting a plant based diet. 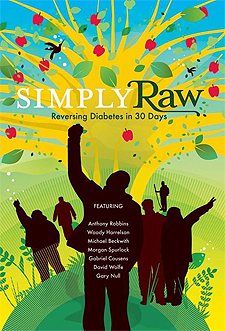 Simply Raw examines the correlation between vegan raw food and diabetes. The documentary features 6 diabetic Americans who go on a complete vegan raw diet for 30 days, and show some amazing results in terms of drop in blood sugar levels and reduced dependency on insulin. This inspiring film chronicles the transformation of an overweight Australian named Joe Cross who was suffering from a rare autoimmune disease. With doctors and medicines given up all hopes, Joe decides to regain his health all on his own – by vowing to live only on fruit and vegetable juice for a couple of months. How he successfully loses 100 pounds and inspires another one suffering from similar health condition makes an interesting watch. 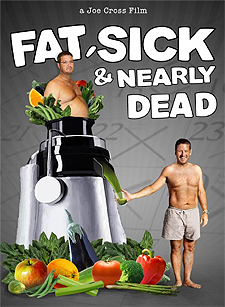 The film also had a sequel in 2014 under the title: Fat, Sick and Nearly Dead 2. Speciesism is a documentary that focuses primarily on factory farming with a mix of philosophy along the way relating to animals role in our human run world. Director Mark Devries, who is in his early 20’s, sets out to investigate the world of of factory farms. 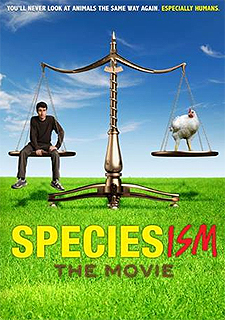 The film gets its name, Speciesim, from the term coined by British psychologist Richard Ryder in the 1970s who claims that animals can be classed at different values than their human counterpart. Devries film works on changing this belief. This is an upcoming documentary that is said to be a sequel of Shaun Monson’s popular 2005 documentary, Earthlings. It is slated for release on 12th August, 2015. 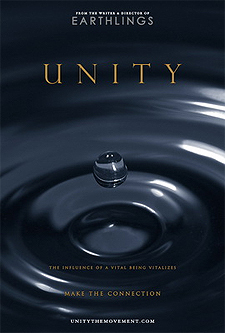 The film explores the reasons as to why the humankind has not been able to live in unity with other stakeholders of the planet despite so much of evolution in religion, philosophy and technology.